_Slim Summerville began his brief career at the Columbia shorts department in 1943. A veteran of the Mack Sennett Studios, he was no stranger to slapstick comedy. His most notable of the two comedies he appeared in for the unit is BACHELOR DAZE, in which he is paired with Emmett Lynn. The duo make a splendid team, and it is a shame no other two-reelers were produced before Summerville's death in 1946. Both titles were syndicated by Screen Gems Television in 1959. If a title is not in ITALICS and UNDERLINED....I do not have it in my collection. _GARDEN OF EATIN' (10/22/43) D: Harry Edwards. Bobby Larson, Chester Conklin, Marjorie Babe Kane, Christine McIntyre, Snub Pollard, Vernon Dent, Al Thompson, Jack Tiny Lipson. Slim is nearly lynched in a tough western town after being falsely accused of kidnapping. TRIVIA: This was Christine McIntyre's first Columbia comedy short. 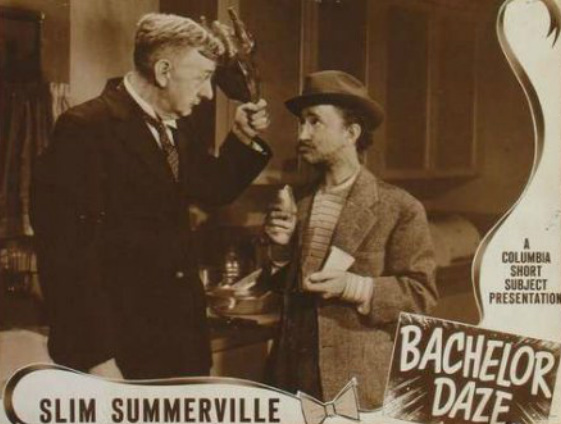 BACHELOR DAZE (2/17/44) D: Jules White. Emmett Lynn, Minerva Urecal, Vernon Dent, Victor Travers, Al Thompson, Frank Sully, Charles Dorety. Slim, prompted by his pal Emmett, makes romantic overtures to the local widow.